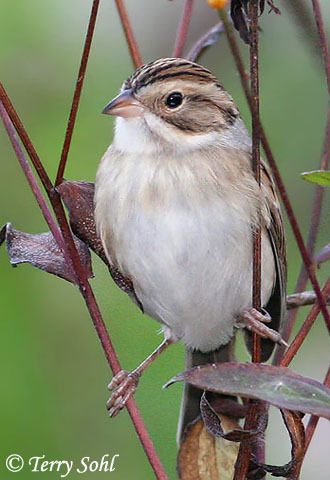 Clay-colored sparrows can be a fairly common sight during the summer in the northern tier of U.S. states. Males are easily observed as they sing their buzzy song from a high perch in their territory. They can sometimes be found in mixed flocks with Chipping Sparrows or Brewer's Sparrows (western South Dakota only for the latter). Habitat: Prefers shrubby grasslands for breeding. This can also include woodland edges, fence lines, and the shrubby understory of forest areas. They also prefer brushy areas during migration and in winter. Diet: The major diet item is seeds, which it consumes in quantity at all seasons. Other vegetative matter includes berries, fruits, leaf-buds, and new shoots. They also feed heavily on insects during the summer. Behavior: Does most of its foraging on the ground or low in shrubbery and other vegetation. Song: Series of three to five identical raspy buzzes. 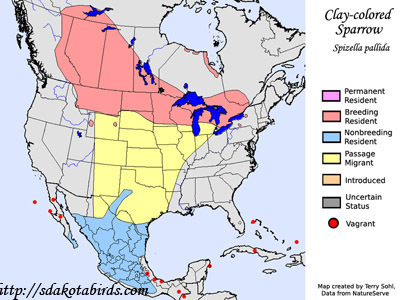 Migration: Summers in the northern tier of U.S. states, and southern Canada. Winters in the southern tip of Texas and points south. Bird Feeders: Will attend feeders for grains, seeds, and breadcrumbs. Conservation Status: Surveys hint at a slight decline in recent decades. Reasons are unknown, but they are a fairly common victim of Brown-headed Cowbird parasitism. Additional Photos: Click on the image chips or text links below for additional, higher-resolution Clay-colored Sparrow photos. South Dakota Status: Common migrant across the sate. Uncommon summer breeding resident in the northeast and north-central.